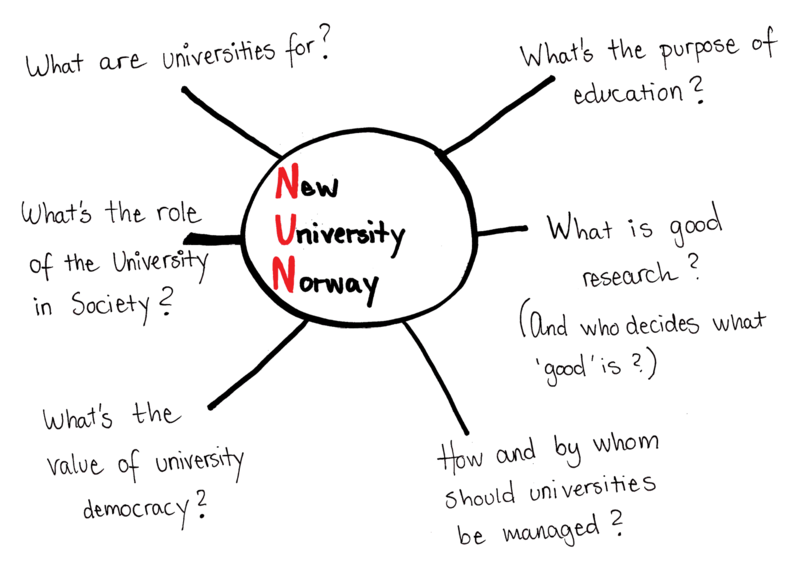 Newuniversitynorway.org has been formed as a response to what we see as an increasing commodification of higher education in Norway at a critical time when corporate agendas are undermining public universities and intellectual integrity around the world. We question the way our universities are increasingly run as businesses and how policy choices are more and more based on financial returns and efficacy rather than guided by scientific and societal needs. While we see this in connection with an incremental weakening of university democracy since the 1990s, current processes of restructuring and policy change in Norway are pushing these questions increasingly up on the agenda. With this web page we hope to create a platform for critical discussions about the future of our universities and what role they should play in society. It forms part of an effort to reclaim this debate which has for too long been left to a small group of politicians and university management. We therefore invite a broad specter of voices to join in in imagining a “New University Norway”.